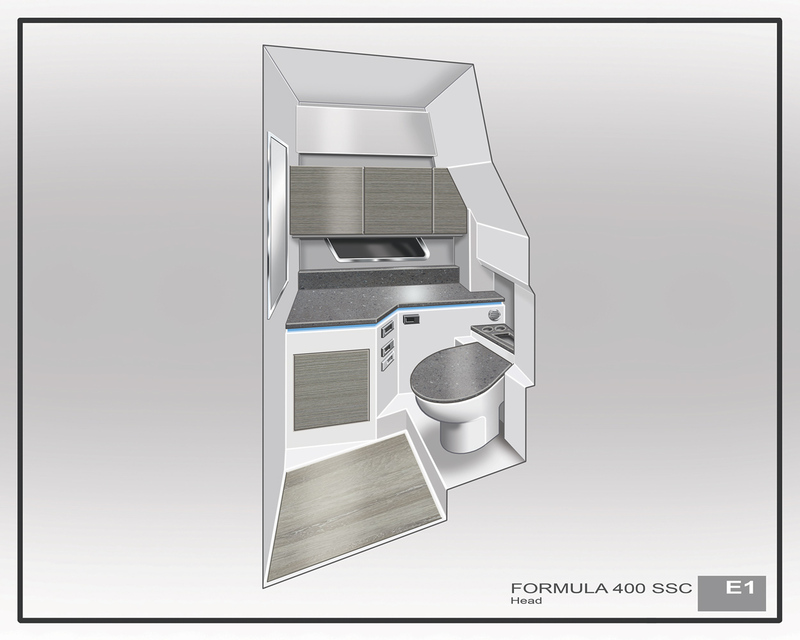 Announcing The All-New 400 SSC –The Latest Member of the Formula Crossover Fleet! 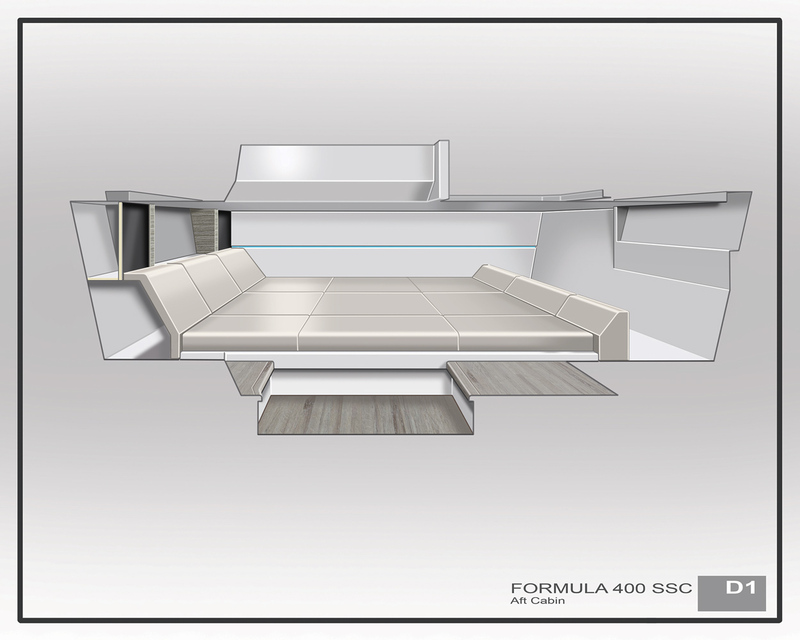 Introducing the Formula 400 Super Sport Crossover, a pivotal addition to the revolutionary Formula Crossover fleet – now five models strong – that is rapidly changing the entire boating experience. Taking its cue from the phenomenal 430 SSC, the 400 combines confident offshore Super Sport performance with versatile, open bow and cabin elements that spring from their unparalleled Crossover line, ensuring that boaters truly can have the best of all worlds. At 40’ in length with a 12’ beam and 21° deep-V hull, the 400 debuts at the Newport Boat Show, September 2018. 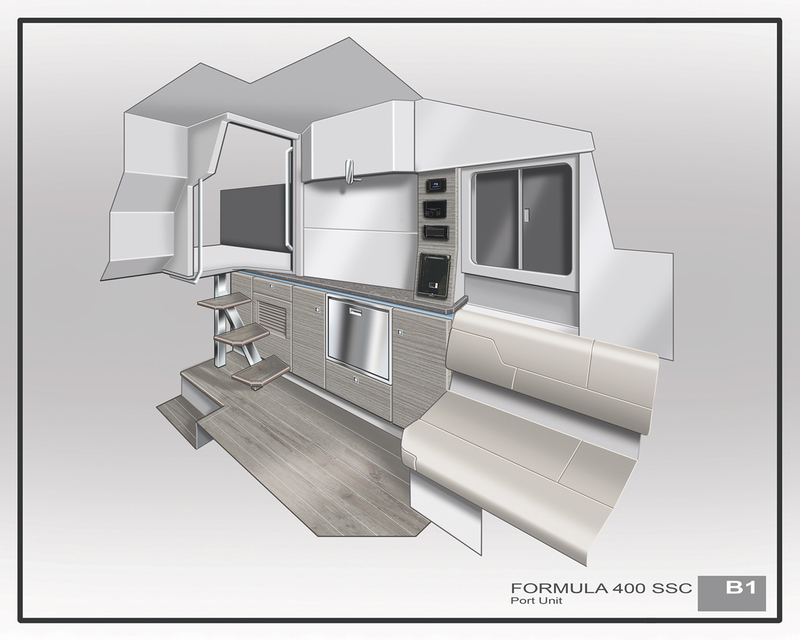 With nearly 37 linear feet of flowing cockpit space, the 400 incorporates the Formula Crossover SmartZone™ concept, creating separate areas for a variety of activities while encouraging connections among guests. Cabin accommodations offer closed bow amenities that include a convertible dinette/sleeping berth plus aft stateroom bed, private head compartment and entertainment galley with sink and microwave. The 400 SSC satisfies every boater’s preference, centering on the full-height windshield that encloses the entire width of the cockpit, so guests can move beyond the confines of a center console’s narrow, pilothouse tradition. The fiberglass hardtop with full-width motorized glass sunroof opens to the sky, while seating zones, from the expansive bow to triple helm seating and U-shaped lounge aft, expand choices for all. The cockpit environment is yours to control with available 18,000 BTU reverse cycle air conditioner and Rockford Fosgate® stereo with USB port, Bluetooth® and ten JL Audio® blue LED lighted chrome-finished speakers with 600W amplification and lighted 200W subwoofer. Formula’s offshore heritage is evident at the helm, where triple command seating offers chiseled support with ultimate comfort in mind. Each seat bottom adjusts for options to sit, stand or rest on the upright seat, while dual-height footrests further customize the fit. The sturdy composite dash features a Liquid Black floating panel showcasing dual Raymarine Axiom 12 GPS widescreen color chartplotters with upgrades to dual Axiom XL16’s or XL 19’s. The 400 SSC also features Mercury® DTS with SmartCraft Vessel View™, intuitive waterproof rocker switches, impressive digital switching, optional wireless iPad™ control and blue LED accent lighting. A lockable glove box with floating Liquid Black front safeguards your valuables while a mobile device rail conveniently displays your screens. Quad Mercury 300 Verado Outboard motors, with upgrade to Quad 350’s, respond instantly to your control with electronic shift and throttle, Mercury® Joystick Piloting and impressive leather-wrapped, polished stainless tilt steering wheel. Whether you’re heading offshore or to inland adventures, the ride is pure Formula – fast-paced, yet solid and secure. Treat your guests to Formula performance and luxury with sumptuously contoured cockpit seating that sports crisp, precision stitching, flowing color accents and recessed lumbar areas. The 400’s SmartZone design utilizes every square inch for uninterrupted entertainment possibilities. Two distinct lounge areas, the spacious U-shaped to starboard and the portside divan, offer versatile spaces for lunch, basking in the sun or enjoying a soothing sunset cruise. The electrically actuated aft cockpit table with filler cushion can be raised or lowered to your preference, ready for any activity you and your guests may choose. The outdoor kitchen to port inspires easy alfresco entertaining with an expansive Corian® countertop, fiberglass molded sink with glide-away self-cover, design-inspired faucet, stainless Isotherm pullout fridge, dedicated trash container, paper towel holder and a full bank of StarBoard® drawers to keep your cooking tools protected from the elements. The Cuisinart® blender stows safely in the port side galley pantry, and the available Yeti® Tundra 35 glides out from the under-seat compartment at the helm. 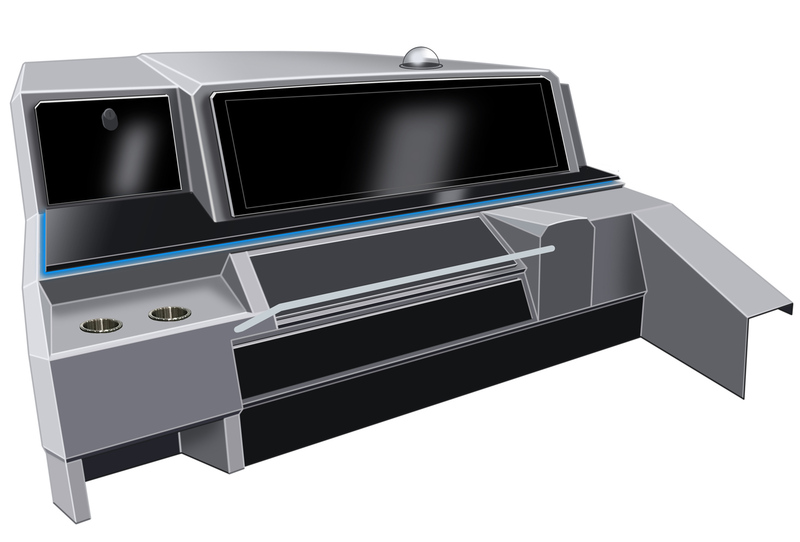 The available 120V Kenyon electric grill can be perfectly positioned in the aft cockpit, offering a separate zone for the creative outdoor chef. The 400 offers a seamless transition to the bow with the flush cockpit sole and slide-open windshield. Expansive wraparound seating boasts comfortable support for an exhilarating ride and easy conversation. Features include a flip-down dual armrest with two drink holders and Corian accent at the forward-facing lounge, a molded-in cooler forward with trash receptacle to port. Two dual-height, Corian-top tables with filler cushions make for multiple entertaining and sunning possibilities. The available waterproof stereo control and bow sun shade with stainless supports are welcoming features to consider. For a closer connection to the water, head aft to the spacious, rear-facing sun lounge with individual backrests that easily adjust fore and aft. Under the lounge, a spacious trunk keeps four fenders safely stowed. Further aft, the 400’s SmartZone design means easy water access off the roomy, extended swim platform with 45 square feet of room, eliminating the need for imposing hullside entries that limit your seating or force your crew to move aside. Swimmers can rinse off, towel and transition to the cockpit without any inconvenience. Entertainment capabilities are extended aft, with the platform’s four drink holders and waterproof stereo control with powerful JL Audio speakers. Choice abounds on the 400 SSC. 24 drink holders throughout the bow and cockpit offer plenty of places to enjoy refreshments and park small belongings. Easy-access storage offers dedicated placement for your boating gear, from under seats to the portside lockers – over 13 different molded fiberglass tubs and lockers, along with tough, gelcoat-finished equipment holds, make it safe and seamless. Ten dual USB charging ports give 20 places to keep your devices at the ready. Blue-white LED lighting throughout allows you to continue the mood, while optional underwater blue lights add distinctive style and appeal. The ‘Sound-to-Light’ upgrade with Wi-Fi control features full spectrum color choices that seamlessly sync to your music, creating a multi-sensory underwater light show. Enter the cabin with ease through the portside door at the helm. Three solid wood steps lead down to a fully molded cabin liner with woodgrain-finish flooring and 6’ 6” headroom, spacious, opening windows and overhead venting hatch. 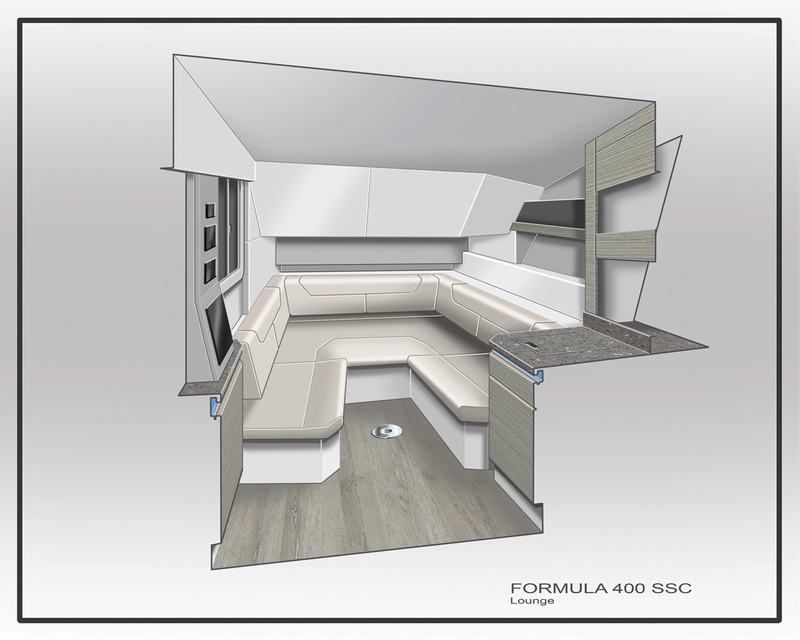 The 430 cabin provides a completely residential experience centering on the U-shaped Ultraleather lounge with dual-height, high-gloss wood table that can accommodate friends for dinner and lowers for sleeping. Berth legroom is easily revealed by raising the forward backrest. A dual USB charging port is conveniently located nearby. The starboard side lower kitchen is beautifully presented in your choice of woodgrain finishes and rich Corian countertop selections. 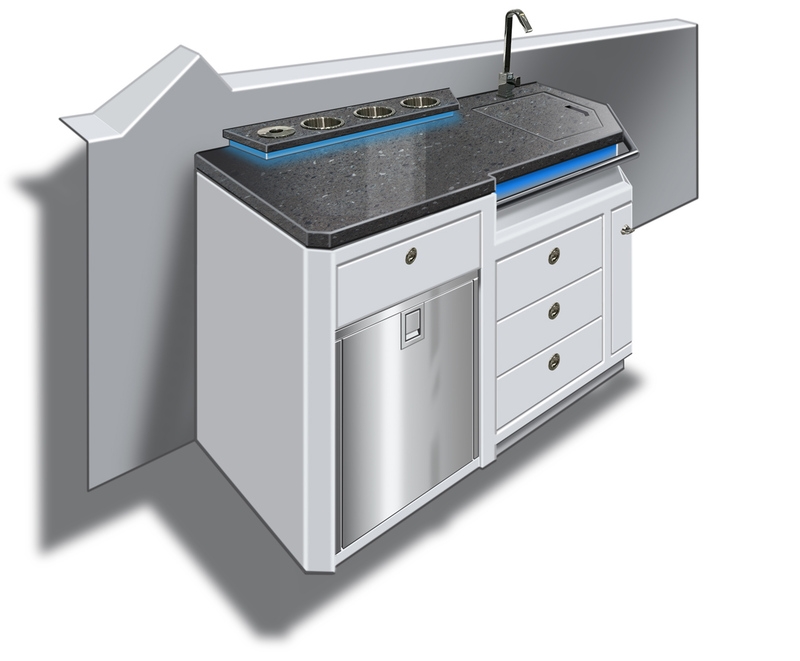 Culinary conveniences include a spacious Corian sink with premium Elka® folding swivel spout and glide-away cover, overhead microwave, available Keurig® coffee maker and concealed trash container. A hardwood dovetailed drawer with automatic silent closure and spacious open and concealed cupboard space keep it all in place. The 32” LED/LCD HDTV with Blu-ray™ player is perfectly positioned to entertain your guests. To port, the large pullout Isotherm stainless steel refrigerator, additional drawer storage plus a roomy cedar-lined hanging locker allow for comfortable stay-aboard journeys. 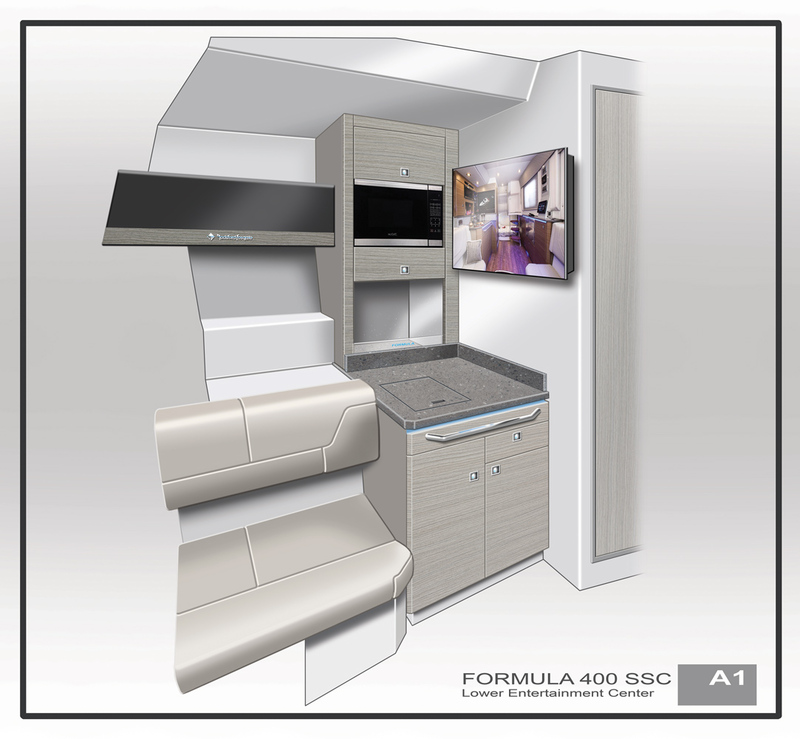 Also to port is the electronics pylon with Rockford Fosgate stereo remote control, air conditioning control, light switches and available LaunchPort inductive charging system for the Formula-provided iPad. Digital switching controls all lighting and air conditioning and also relays chartplotter and engine information. A separate app with the stereo upgrade puts control in your hands with four cabin speakers that bring pure audio clarity while blue LED lighting acts as a dramatic design element throughout. The spacious head features a molded vanity with Corian countertop, molded fiberglass sink, high-gloss woodgrain-finish lower cabinet, Vacuflush® head unit and shower. The aft cabin stateroom with privacy curtain features a permanent queen-size bed with memory foam mattress, so there is no need to convert the lounge for primary sleeping. The upholstered headboard with individual reading lights and hideaway storage, pillow shams, available wall LaunchPort inductive charging system, dual USB charging ports, available 32” LED/LCD HDTV with Blu-ray player and deep storage areas at the foot of the bed make this a perfect retreat. The 400 SSC FAS3TECH multi-step hull with molded structural grid delivers the swift, stable Formula performance that is world renowned. Now boaters can venture beyond narrowly defined conventions and enjoy all that boating was meant to be. 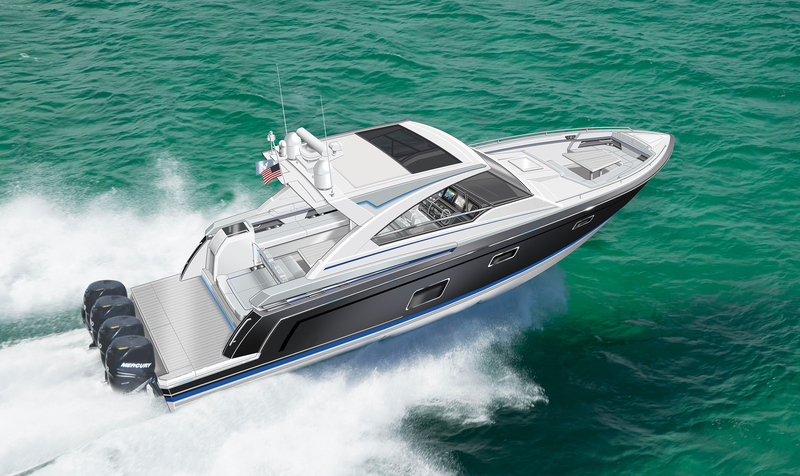 The Formula Crossover fleet, from 33 to 43 feet, now five strong and growing, is here to bring it all – break free in the newest addition, the Formula 400 Super Sport Crossover! The FAS3Tech multi-step hull design with quad outboards delivers world renowned Formula performance. Break free in the newest addition to the Formula Crossover fleet, the Formula 400 Super Sport Crossover!